Testimonial ~ Baby naming ceremony: ‘With a deep love of nature but with no particular religious faith we felt unsure how to celebrate the arrival of our son, Adam. With Jean’s imaginative guidance we created a beautiful ceremony which took place in our cottage garden beneath the willow tree. Everyone wrote wishes for Adam on cotton flags and tied them to the willow tree. Jean suggested we ask special friends to be guardians to Adam for Male Youth, Wisdom, Creativity and Spirituality. A day full of truly wonderful memories. Thank you Jean’ Carrie and Brian Cort. Testimonial ~ Wedding: ‘Thank you so much for officiating at our wedding. You have been fantastic, helping us to develop ideas and enabling us to have our day our way! Your input and guidance has been brilliant, we can’t thank you enough!’ Helen & James. Testimonial ~ House blessing ceremony: ‘Jean Francis designed a house blessing ceremony for me when I moved, into a small & unloved flat. Her own gentle presence & the creative ritual she designed so beautifully, enabled me to turn an empty house into a welcoming home. Maybe we all need such a tangible Blessing Ceremony to experience the Divine in our daily life.’ Sue Cash. 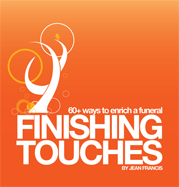 Testimonial ~ Pre-planned funeral: ‘When Jean first asked me whether I’d given any thought to planning my funeral, I was intrigued! However, the more I thought about it, the more I realized that, especially having no family of my own, it was important to give it some serious thought. 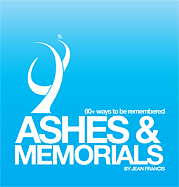 Working through a comprehensive and carefully thought out questionnaire that she’s devised, Jean leaves no stone un-turned, no aspect unexplored – and I had no idea it would be such fun. Under her sensitive guidance, and with her extensive knowledge of “what’s possible”, I can now rest assured that when the time comes, my final farewell will say it all, and reflect that which I value and love most. It will certainly be an occasion to remember – and I shall be there to watch it! Jo, Roger, Felicity and I all want to thank you from the bottom of our hearts for everything you’ve done for us. You made the day complete with your wisdom and kindness. So many people have been thanking us by email and letter, it’s been quite overwhelming. What other clients have to say……..
Howard was a Pagan with a deep interest in Native American culture. His woodland funeral included an Invocation to the Four Elements, Father Sky and Mother Earth and the Native American Ten Commandments. 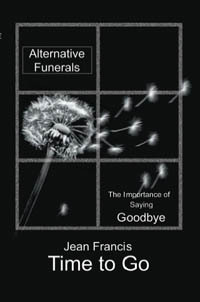 ‘I would like to say how much I appreciate the kindness and sensitive way that Jean Francis composed and then conducted the funeral ceremony for my late husband, Howard. Many of those who attended said how impressed they were with her treatment of the occasion.’ Marie Rodway.